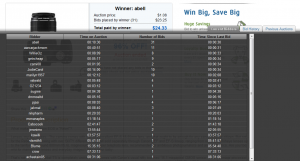 Allow us to introduce you to the competitive shopping auction penny auction, BigDeal.com. BigDeal is backed with an experienced team and millions of dollars in venture capital funding from investment groups such as the Mayfield Fund, First Round Capital, and Foundation Capital. There’s a feature on BigDeal.com that we’ve only seen on a small number of other pay-per-bid auction sites, which allows losing bidders to apply the full value of their bids placed to actually purchase the item at retail. So in essence, a bidder never really has to lose anything on BigDeal.com, as opposed to the majority of similar auction sites where a bidder can spend hundreds of dollars on an item and lose. BigDeal.com has competitive pricing too, they check prices on a weekly basis against Amazon.com and other popular retailers. BigDeal.com also has generous “Loyalty Bucks” program where every bid that a user purchases, users receive $1 in Loyalty Bucks per $1 spent, users receive this as soon as bids are purchased and they’re good to be redeemed for a year from the date of purchase. These Loyalty Bucks can be redeemed for a 25% discount on gift cards and products. Each bid raises the price of the item by $0.15, $0.01. Bid Refund Policy: BigDeal will refund any unused bid for up to 12 months after its purchase. Timer Increments: Most of BigDeal’s auctions have 30 second increments, although a few have 20 second increments. Once the clock reaches 30 seconds, it does not get above the 30 second mark again. They think this makes the auctions more fun, fast, and fair. BigDeal’s Auctions are available in: The USA, for now. Win Limits: 10 per user, per month. Product Offerings Include: Small appliances like Espresso machines, toasters, coffee makers, and vacuum cleaners, to popular consumer electronics, video games, gaming consoles, iPods, 27″ iMac Computers, MacBooks, HDTV, digital cameras, various Windows laptops/netbooks, Amazon’s Kindle, and the new Apple iPad. Nicolas Darveau-Garneau, CEO of BigDeal.com, was gracious enough to allow us to interview him to learn a bit more about BigDeal. After graduating from Harvard Business School, you co-founded Imix.com, the first Internet music company to get the legal download rights from all major record labels. You were also part of the launch team of MSN.com in 1995. What got you interested in the entertainment shopping industry? I wanted, along with my Co-Founders Brandon Ramsey from Yahoo and George Leimer from Apple, to create a website with an unbelievable value proposition for customers. Saving 80%-90% off on a brand new ipod, flat screen TV, or SLR camera is a really attractive value proposition for customers and our users love the site! BigDeal.com started out stealthily as Project Fair Bid and raised over $4.5 million in venture funding from the Mayfield Fund, First Round Capital, Foundation Capital, with Raj Kapoor, Charles Moldow and Josh Kopelman on your board of directors. Can you tell us what convinced these prominent investors to join forces in supporting BigDeal.com? Nicolas – BigDeal.com: I don’t want to speak for our investors but I can share my perspective: BigDeal.com has created an incredibly powerful value proposition for customers and it’s not often that an ecommerce site can create such a unique and strong value proposition. This is a once in a decade opportunity, in my view. You’ve been open since November 19th, 2009, with featured articles on TechCrunch [BigDeal.com Reinvents And Legitimizes Swoopo’s Controversial Auction Bidding Model] and The New York Times [BigDeal Puts a New Spin on ‘Entertainment Shopping’], how has the response been? Nicolas – BigDeal.com: The customer response has been unbelievable. We are way ahead of plan in terms of growth. Most importantly, we are getting a lot of repeat usage on the site. We are focusing on creating long term and loyal customers and the response has been truly remarkable so far. What makes BigDeal.com unique from all other pay-per-bid/penny auctions? Nicolas – BigDeal.com: We are focusing on creating long term, loyal users. To achieve this, we have created a number of powerful features including the ability to buy any item during an auction for a total of its retail price using our “Buy It Now” feature and our “Loyalty Bucks” that allow users to use ALL the money they spend on bids to get a discount on items in our reward store. As the New York Times put it, we have “taken all the risk out of the bidded-auction game”. 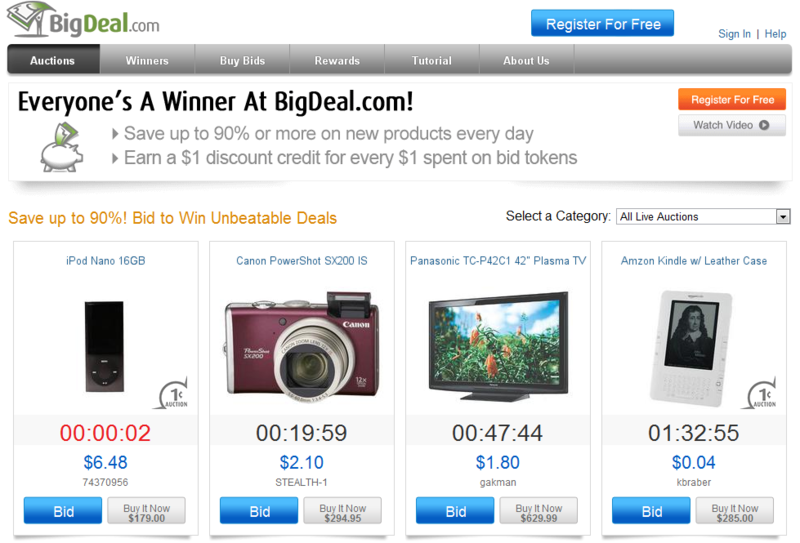 Basically, on BigDeal.com, auction winners get a really big deal while non-winners can get all their money back. There is literally no risk to bidding. The downside of all this is that we are giving a lot of money back to the users and it will more difficult for us to be profitable. We noticed that you don’t allow your users to use automatic bidding, what made you decide to do this? Nicolas – BigDeal.com: We are actually working on an auto-bid feature right now but, like everything else we do, we are going to launch an Auto Bidder that is a lot more fair and user-friendly than what is currently out there. Our auto-bidder will be truly unique and useful. Join our forum and discuss your experiences with BigDeal.com and post your review in our reviews directory. Concerning they say its a multi-million dollar company, that makes me go: "Hmmmm." I am sorry, it does look like a scam to me. What a great idea originally. 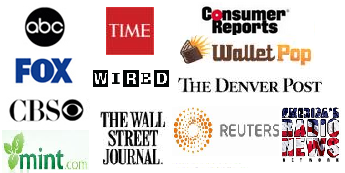 I do not blame the media for covering similar businesses, but they should do their research before endorsing them. I accidentaly landed on this website, and just out of curiosity, observed one auction that was almost ending. While the bids were somewhere around 28 bucks, and as the bidders kept increasing their penny bids, all of a sudden, somehow mysteriously won the item for 181.36. I contacted the site to clarify how this was possible, as they claim the increments go by pennies.. Then, since I have not heard back from them, I made my math and calculated, how much this “mysterious” winner would have ended up paying for the item, besides the winning bid price of 181.. last recorded bid was 28, so, here it goes (181-28)x100x.75 (every bid that increases the price costs .75). Do your math! Plus, all the bids that went placed before, unrewarded.. Yes they sure do get a lot of bids now.. what I like about Bigdeal in particular is the buy it now option. I can spend $retail of a laptop in bids and then buy it now and only pay what I spent on bids (=retail). Thanks for stopping by! I think its fine. I won a $400 netbook for $13.53 and a amazon kindle for $103, the key is that you have to expect to pay retail, have the money to pay retail ready, and then you would only be pleasantly surprised, poster before said Crueman569 is a fake user, and it could be true but I doubt that, because I end up having to do that sometimes where you keep bidding and other people keep bidding so you end up bidding the retail, but that's no big deal to bid to retail, because you still get your item and by bidding to retail you will probably accumulate a couple 100 bucks in loyalty dollars that you can spend on another item, for example 2 days ago i was bidding on a $500 tv, i put about $485 worth of bids on the tv and the auction price was at $15 dollars, so i maxed out in bids. so used the buy it now feature and bought the tv for $15, and now i have $485 that i can use towards other items, so in reality I got the tv for $15. Other people realize this too and thats why they are willing to throw up over 500 bids on a auction. It really is how you look at it, if you are only willing to pay less than $10 for that ipod your going to get screwed. the key is to bid, bid often, people will sometimes be turned off by someone bidding often, so that is an advantage to you. Expect to pay retail on everything you bid on and bid to retail on everything you bid on. and to use the loyalty dollars. Defiantly a win win site. It does require a lot of luck in order to get deals on this site and it also requires a ton of patience. I won an Ipad 64gig wi-fi for only $77.93 (including 9.99 shipping)… but I watched the item for 7 hours waiting for a good time to bid. I lucked out I guess. It's risky but it can be worth it. Only had to place 7 bids on the item.